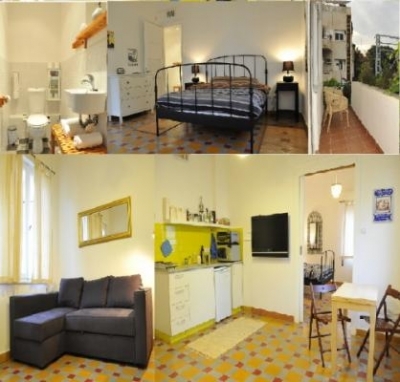 Dov hoz 6 Apt B: Walk to the beach and stores! Luxury vacation apartments for long and short term. In a Conservation Building. The suite composed from one double bedroom, one living room, balcony, kitchen, bathroom/shower and toilet. In the living room there is a sofa that can be turned into double bed There are also more mattresses in the house. All suites have a fully equipped kitchenette (all the cutlery and crockery, microwave etc') with a dinning table and 4 chairs. The suites are air conditioned. 2- 37' LCD TV + Cables, Internet (wifi), iron and DVD player. Our suites are all in an ideal location for tourists: 5-7 min walk from the beach, grocery stores and near Tel Aviv centers Dizingoff and Ben Yehuda streets. Located right at the heart of Tel Aviv.